Hello friends! It’s me, Frankie! 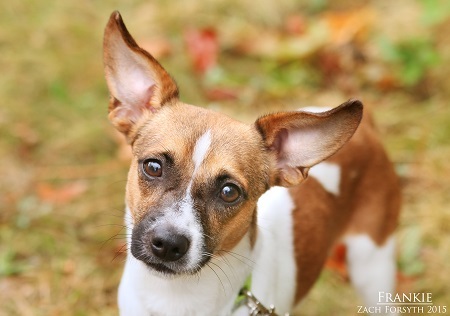 Your fun loving, ball fetching, Terrier friend who can’t wait to meet you! I’m a 3 year old boy that has a happy heart and gets along with everyone! Dogs, cats, kids (humans and goats), lady bugs, teddy bears, I’ve got plenty of affection for everyone. Did I mention my smarts? Oh yeah, I’m a quick learner who has great training potential for those of you who wants a dog that can jump through a hoop or give high-fives. I don’t have those skills yet, but can learn faster than a jumping jack rabbit (jack rabbits, although fast, aren’t actually any good at obedience training, haha)! Whatdya say? Am I the pal for you? Fill out the adoption application so we can schedule a meet and greet! I am fixed, vaccinated, and microchipped. My adoption fee is $250 and I am currently living in foster care.